The economy of the world is a complicated thing. In economics, whether directly or indirectly, just about everything affects everything else. Big or small, every last detail counts. And this became very evident throughout Monday as the stock market opened for the week. With concerns over the debt issues facing European states growing lately, investors decided to play it safe on Monday, which led to some very unfavorable results. Almost at the instant that the stock market opened on Monday, stocks plummeted. The Dow Jones fell over 150 points the instant the trading floor opened up. To close the day, the Dow Jones dropped an entire percentage point, or 131 points total. It ended the day at 12,381 points after opening at over 12,500 points from a strong finish last week. The S&P 500 dropped even more than the Dow Jones. 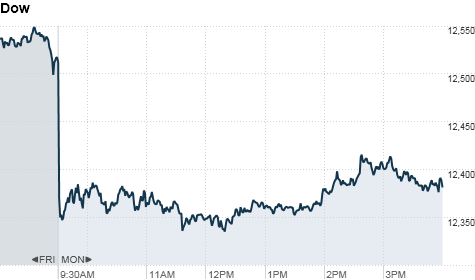 The S&P 500 fell sixteen points amassing at a total of 1.2%. It closed the day at a solid, but considerably lower, 1,317 points. The Nasdaq Composite was no exception to the trend on Monday. It decreased all the way down to 2,759 points. It was a total drop of forty-four points, or 1.6%. Drops in rates were evident across the board as results in the red for the day were visible at every turn. Banks and financial brokers also took a big hit on the day. JPMorgan Chase, Wells Fargo, Goldman Sachs, Citigroup, and Bank of America all fell greater than one percentage point on a day that treated few well. This was all caused by the dependability of the financial systems of European states being downgraded by Fitch, a rating agency. Greece and Italy saw the most notable decreases in ratings. In addition, the manufacturing market in Europe also saw reports lower than were expected. To look at the situation in a brighter context for Americans, as a result of the troubles that European countries are facing, the US Dollar has hit a sixty-day high against the euro. So far in the month of May, all stock indexes in the United States have dropped two percent across the board. To add insult to injury, both the S&P 500, as well as the Dow Jones, have ended the last three weeks lower than the one before. It is tough to say what effect this will have on the United States and the rest of the world. Whether this is the beginning of a downward spiral or just an unfortunate month is difficult to say this early on. While the signs are not good, it is still too early to worry too much.